Get the best service and rates by dealing direct with Lady Douglas River Cruise. The iconic Lady Douglas takes you searching for estuarine crocodiles and other wildlife, on an idyllic calm water river cruise through the mangrove forests around Port Douglas. All cruises showcase a wide variety of visual delights; take in the spectacular wilderness and scenery of the mangroves, wildlife, shipwrecks, and harbour and coastal views around the inlet entrance. The commentary delivered by the captain is informative and entertaining, with comfortable and relaxed surroundings, and no chance of getting seasick, despite the weather. We are a calm water cruise and have covered seating over the entire back deck. Substantial time on board is spent searching for wild estuarine crocodiles in their natural habitat and exploring the mangroves. Sunset Cruises include a stunning sunset at the end of the tour. Everyone receives a complimentary drink and nibbles. Hot enough?! Come and chill out on the coolest boat in town! Enjoy a beautiful cool breeze across the bow as you sip on your complimentary icy cold drink. ALL CRUISES INCLUDE A COMPLIMENTARY BEVERAGE AND NIBBLES. Lady Douglas Midday Cruise 1(2.30-14.00) in Dickson Inlet. All cruises showcase a wide variety of visual delights; take in the spectacular wilderness and scenery of the mangroves, wildlife, shipwrecks, and harbour and coastal views around the inlet entrance. Lady Douglas is a handsome, stable riverboat. She has been taking Port Douglas visitors on tours of the Dickson Inlet since 1989. On board we have comfortable seating, a licensed bar and galley, toilets, and room to stand and move around during your cruise. She is an ideal nature viewing platform with protection from the elements. She has wheelchair and buggy access and is suitable for supervised children of all ages. Cruises depart from the main marina in the heart of Port Douglas, just a short walk from most accommodation. On all cruises there is a variety of things to see, taking in the wilderness and scenery of the mangroves, and the coastal and harbour views around the inlet entrance. There is an informative and entertaining commentary by the skipper, comfortable and relaxed surroundings, and no chance of getting seasick, whatever the weather. Most of the time on board is spent searching for wild crocodiles in their natural habitat and exploring the mangroves. Time is also spent at the inlet entrance, more so on the sunset cruise where this is the best place to enjoy the sunset views. Each cruise includes a complimentary beverage and nibbles ! Lady Douglas is available for sole charter - please contact us for quotes and ideas. We can access the calm water areas near Port Douglas so there is no chance of seasickness or interruption due to strong winds. Port Douglas is a perfect place for a romantic wedding – especially at St Mary’s by the Sea or under the palms by the waterfront in Ana Park. Both are adjacent to the historic sugar wharf. Lady Douglas can collect passengers from the wharf and provide a river cruise and transfer to reception venues such as waterfront or marina restaurants. Drinks can be provided and catering or live music can be arranged if necessary. In addition, Lady Douglas herself can act as a venue for ceremonies or receptions. Lady Douglas is fully licensed and can cater for both day and night-time events. A music system is on board or live music can be arranged. We've had memorable parties on board ranging from children’s birthday parties croc-spotting in the morning, to hens or bucks nights, corporate events and company Christmas parties. 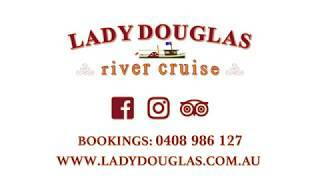 Groups, clubs, and corporate teams have included Lady Douglas in their Port Douglas itinerary as a private and easily accessible river cruise. Small groups can also join one of our scheduled cruises. The mangrove ecosystem is fascinating and the views of the coastal mountains provide a great backdrop. Saltwater crocodiles are normally seen on over 90% of cruises, particularly in the dry season. They tend to be solitary and territorial. Although the population density is low we have good success at finding them as we know their territories and favourite locations. We very regularly see birds of prey such as brahminy kites, ospreys and white bellied sea eagles. Other birds such as mangrove herons, whimbrels, rainbow bee-eaters, sunbirds and kingfishers are normally seen. Whilst staying in calm water each cruise also passes along the harbour and waterfront for great coastal views. There is also an interesting mixture of boats and harbour activity. 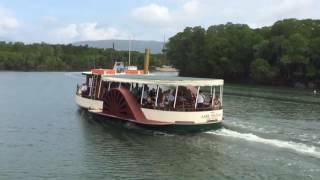 Because Lady Douglas operates from the marina in the heart of Port Douglas she is particularly convenient for those without a car or visitors looking for a short duration inexpensive tour. Dickson Inlet is a fantastic asset to Port Douglas and the mangrove flora we see is characteristic of estuarine areas in Far North Queensland. For those with a car we encourage an additional visit to the Daintree River about 1 hours drive north. In the upstream reaches there is more freshwater influence and the areas are quite different. Thankyou so much for all your votes so far Folks! We’ve been nominated for “BEST RAINFOREST/RIVER CRUISE “ and “BEST TOUR GUIDE “ - if you haven’t yet voted please show your support and click on the link below. You guys are fantastic!!! Busy, but Happy Day's on the beautiful Dickson Inlet, spotting croc's and other beautiful wildlife. Running four tours every day at the moment. See you on the water. Fantastic early evening cruise yesterday! Lucas and Anne couldn't of been more welcoming and knowledgeable. Fantastic value for money and with a drink on arrival and nibbles too! We thoroughly enjoyed this trip and would highly recommend to others. We were lucky enough to see two crocs too, brilliant! The cruise was awesome. Even being a North Queenslander, I learnt something new. Lucas, our captain and guide, has a great Aussie sense of humour that had us entertained throughout the cruise. Nikki, our hostess made sure we were all comfortable. My partner, my two kids (9 & 12) and I would recommend this cruise, not just for visiting friends and family, but for our local North Queensland friends as well. Awesome! The best value for money ever. Drew and Jo were great hosts making sure we all had an enjoyable time. The comentry was informative and fun. The comlimentary drink and snacks were a treat. I highly recommend going on the Lady Douglas River Cruise.